Interstate 80 to Exit 73(Plank Road),South to frontage road, West to 1st left(Hollerich Drive), Left to 2nd Building on right. It doesn't matter if you're moving a couple houses down or across the globe; our friendly, professional movers are ready to help. Our large facility has 40,000 square feet of indoor storage perfect for keeping the things you don't use very often, safe and sound. Load your items into our well-padded crates, and we'll add them to our inventory of palletized storage vaults for safe keeping. 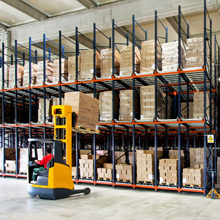 Our warehouse is climate controlled to help protect your possessions from the damage humidity can cause. With our convenient location near the I-80 and I-39 interchange, our carriers are able to distribute to many markets overnight or the next day, allowing you to get the goods you need quickly. If you're a business in or around Peru, IL, we offer local delivery services so you can get what you need on time. Thieves don't need much information to steal your identity or to a wreak havoc on your business' accounts. 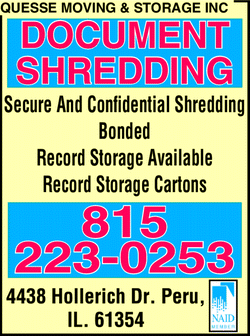 We'll help you destroy that information properly, so you don't have to worry about it ending up in the wrong hands.